We Are God’s Garden! God’s Farm System for Spreading the Word! (Ver 1.1) This is now “Part 4” in the Bible study series on Genesis 3. Today will be a different perspective to the study of the Garden of Eden. If you have not read the lessons from the beginning I would recommend that you go and start with “Part 1” first. I believe today’s modern families miss out on the concept of farming and raising your own food to eat. In our modern society, if we are hungry we go the restaurant or go to the grocery store and everything is nicely packaged and easy to buy. Less than a hundred years ago, people normally didn’t have it so easy. 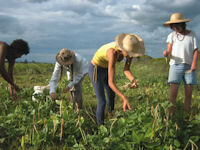 Many people grew up on farms that planted crops that not only fed them but were used to sell to others to earn a living. The modern farm has everything heavily mechanized and machines take the place of what use to be done by hand. These large corporate giants have eliminated the need for people to grow their own food to eat and have created a population that is totally dependent upon someone else for what they eat. Someday when the antichrist shows up, he will certainly use this leverage to gain control over the population. For thousands of years, farming and growing food was the normal everyday life style of the majority of people. When Jesus was physically present on the earth he taught many lessons using principles found in farming and raising crops. These natural elements and systems that God had created pointed us to spiritual truths and reveal to us the spiritual principles we are confronted with on a daily basis. So even though we don’t normally grow our own food these days, it does not mean it is not important to fully understand these concepts. 1Co 3:9 For we are labourers together with God: ye are God’s husbandry, ye are God’s building. The Bible actually declares that God has a garden. This is obviously not a physical garden but a spiritual garden. The term translated as “husbandry” in the KJV of the Bible is a Greek word that means “farm”. This term is referring to a place where things can grow. These verses in 1 Corinthians 3 are describing to you a farming process, using farming methods. To clearly understand what is being taught you really need a firm grasp of how farms operate. I am not an expert, I have learned a few things from some who were farmers so I’ll just hit the highlights of what I have learned. Farming is a multi step process. It involves many factors and while it seems simplistic, it is actually very complex to do it correctly. The ground or soil must be prepared. It normally involves a process that breaks up the hard surface and turns the soil revealing the parts that are covered. We can then begin the process of sowing or planting seeds. There are many ways of planting seeds and the exact method used depends upon the seed that is being planted. The depth of the seed can vary depending upon anticipated amounts of rain that you are expecting. The number of seeds per inch or foot can also vary depending on the crop. Then there is the time factor. Time is a necessary component to allowing the plant to develop. The amount of time can vary tremendously based upon the type of seed planted. Another key factor for planting is the timing or season to plant in. There are designated times to plant specific crops, some are in the spring, some in the summer and even some in the fall. So timing is everything in the process of getting a crop. The other essential element to a successful crop is rain and water. In 1 Corinthians 3 6, it implies that is what Apollos was doing, even though it was the exact same thing that Paul did, the first one planted, the second one watered. Too much water is not good and not enough can be detrimental to the outcome. In these verses it strongly suggests that farming is work. A laborious task and an extraordinary effort to produce a crop. But these verses also speak that it is not just one’s effort that produces the crop. The other factors are the seeds that you are sowing, the timing of the planting, the amount of water the seeds get, the amount of sunshine that these growing plants get, the fight to eliminate pests and creatures that eat you crop before you get to harvest, then there are climate and temperature variations that can cause harm to crops. The lessons of farming and the implications to sharing God’s Word are phenomenally important. How many know that Jesus is not talking about a natural farm crop? Jesus is speaking of a spiritual crop of people. Those that belong to God will be harvested, those that do not will be burned. This verse declares that God has specifically planted seeds into the hearts of men and women. It also implies there are some plants that God did not plant also. Where did these plants or weeds come from? You see in natural and spiritual farming there are a number of known enemies to the expected outcome. You didn’t have to plant a thing for these enemies to show up and they are not what you want to grow in your soil. I noticed I don’t have to plant thistles and wild flowers in my yard, they somehow just magically appear. Isn’t that amazing? Jesus tells us in this parable that God’s garden has an enemy. It implies that while God was away from the garden, his enemy came in and sowed tares among his wheat crop. There is an amazing truth given to us in this verse if you understand farming. By only looking at the surface of the ground you cannot tell what has been planted. The wheat represents the desired crop of the seed that God has purposely planted. But, the tares are the result of the seed of God’s enemy. We can learn a valuable lesson from just this one verse. You are wise if you recognize that not everything in the world is intended to help you. Every false religion and philosophical writing that is out there are the seeds of the enemy. I’ll go so far as to say that every Hollywood movie and non-Christian television show are seeds of the enemy. I know that went over big? Jesus then tells us that both of these seeds are growing together, in the same soil, competing for the same water supply, competing for the same nutrients of the soil and existing in the same duration of time. It is only after some time that you can even tell that both are present. This process speaks to the power of God as well as the subtly and deceptive power of the enemy. In verse 27, Jesus, describes us, the servants of the householder asking God a question. This is obviously a great question and one more of us should be asking today. Where did all of these things come from that are opposed to the truth? Where did all of these things come from that distract us from what we should be focused on? Oh well, I guess I will move on. Jesus reaffirms to us that these weeds are a result of what Satan has done in the earth. Then in verse 28, the servants ask another question of the LORD. Many have asked the same question but in different terms. We have all questioned God why, when something bad has happened to us? Here we have a bad plant in the garden and what would you normally do with a weed in your garden? The servants want to know if it is OK to pull up these weeds and get rid of them. I’ve often times have pondered the same reality in the earth, why after the resurrection of Jesus Christ did God not eliminate evil from the planet. There must have been a legitimate reason for leaving it here. So Jesus’ reply is No! Many times in war the Generals are faced with acceptable casualty rates. Acceptable civilian casualties. According to God’s philosophy, there are no acceptable loses. Every plant is important. If you have ever had a garden you know that pulling weeds can sometimes hurt the real plants that you want to grow. The roots are many times intertwined with each other. So if you pull one you may destroy the other. In God’s garden this is not acceptable. God wants every plant that He can get. In this verse in James, our God is called the husbandman. A husbandman is a term for a farmer. The Greek word literally means a worker of the land or ground. The husbandman is the one that harvests what he plants. He plants, he cares for his harvest, he works the harvest and brings in the fruits of his labors. These are all farming concepts and methods. We can see that God who is a spirit has planted a spiritual garden and He expects to receive the fruits of His labors. So these are spiritual Bible concepts, sow the seeds, water them, care for them and expect God to produce the fruits to harvests. Now go back and reread Genesis 2 and 3. See how God plants a garden, what kind of garden do you believe this was? If God is a Spirit which the Bible declares is accurate then God planted a spiritual garden. If you are reading and studying in the Genesis 3 series you may continue to Part 5 now. Posted on January 3, 2010, in Bible Study, Chapter 3, Genesis and tagged Bible, Christianity, Church, creation, farming, Genesis, God, Jesus, man, seeds, understanding. Bookmark the permalink. 1 Comment. Good insight. Your fellowship helped me.